Manuscripts must be submitted to the journal in electronic version only via online submission system at http://dergipark.gov.tr/masteb. Original research papers; review articles; short communications; letters to the Editor; book reviews. Short communications; describing work that may be of a preliminary nature (preferably no more than 3000 or 10 manuscript pages including tables and figures). Book reviews are also published. Use a 12-point font (Times Roman preferred), including the references, table headings and figure captions, double-spaced and with 25 mm margins on one side of A4 size paper throughout the manuscript. Use 25 mm margins on all sides. The text should be in single-column format. In particular, do not use to hyphenate words. The names of genera and species should be given in italics and, when first mentioned in the text, should be followed by the authority. Authors should consult a recent issue of the journal for style if possible. Articles must be structured in the conventional format such as Introduction, Material and Methods, Results, Discussion, Conclusion, Acknowledgments, Conflict of Interest, and References. Each page must be numbered, and lines must be consecutively numbered from the start to the end of the manuscript. Do not justify on the right-hand margin. The first line of each paragraph must be indent. Do not put a blank line between paragraphs. The first mention in the text of any taxon must be followed by its authority including the year. Use only SI (international system) units. Keep these to the absolute minimum and placed before the reference section. Please ensure that each reference cited in the text is also presented in the reference list. Cite literature in the text in chronological, followed by alphabetical order like these examples “(Mutlu et al., 2012; Biswas et al., 2016; Yanık and Aslan, 2018)”. If the cited reference is the subject of a sentence, only the date should be given in parentheses. Formatted like this examples: “Sönmez (2017)”. References should be listed first alphabetically and then further sorted chronologically at the end of the article. More than one reference from the same author(s) in the same year must be identified by the letters a, b, c, etc. placed after the year of publication. Yamasaki, J., Miyata, H. & Kanai, A. (2005). Finite-difference simulation of green water impact on fixed and moving bodies. 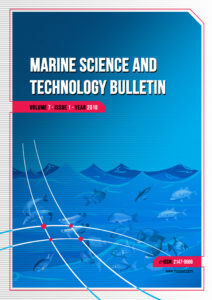 Journal of Marine Science and Technology, 10(1):1-10. Yanık, T. & Aslan, İ. (2018). Impact of global warming on aquatic animals. Pakistan Journal of Zoology, 50(1): 353-363. Sönmez, A.Y., Kale, S., Özdemir, R.C. & Kadak, A.E. (2018). An adaptive neuro-fuzzy inference system (ANFIS) to predict of cadmium (Cd) concentration in the Filyos River, Turkey. Turkish Journal of Fisheries and Aquatic Sciences, 18(12): 1333-1343. Brown, C., Laland, K. & Krause, J. (2011). Fish Cognition and Behavior. 2nd ed. Oxford, UK: Wiley-Blackwell. Langston, W.J. (1990). Toxic effects of metals and the incidence of marine ecosystems, p. 102-l22. In: Furness, R.W. (eds. ), Rainbow heavy metals in the marine environment. CRC Pres., New York. 256p. Vassallo, A.I. & Mora, M.S. (2007). Interspecific scaling and ontogenetic growth patterns of the skull in living and fossil ctenomyid and octodontid rodents (Caviomorpha: Octodontoidea). In: Kelt, D.A., Lessa, E., Salazar-Bravo, J.A., Patton, J.L. (eds. ), The Quintessential Naturalist: Honoring the Life and Legacy of Oliver P. Pearson. 1st ed. Berkeley, CA, USA: University of California Press, pp. 945-968. Sönmez, A.Y. (2011). Karasu ırmağında ağır metal kirliliğinin belirlenmesi ve bulanık mantıkla değerlendirilmesi. Ph.D. Thesis. Kastamonu University, Kastamonu, Turkey. Notev, E. & Uzunova, S. (2008). A new biological method for water quality improvement. Proceedings of the 2nd Conference of Small and Decentralized Water and Wastewater Treatment Plants, Greece, pp. 487-492. FAO. (2016). The State of World Fisheries and Aquaculture: Contributing to food security and nutrition for all. Rome. 200 pp. FAO. (2018). Report of the ninth session of the Sub-Committee on Aquaculture. FAO Fisheries and Aquaculture Report No. 1188. Rome, Italy. Froese, R. & Pauly, D. (Eds.) (2018). FishBase. World Wide Web electronic publication. Retrieved in January 11, 2018 from http://www.fishbase.org. Tables, numbered in Arabic, should be on separate pages with a short descriptive title at the top. Place footnotes to tables below the table body and indicate them with superscript lowercase letters (or asterisks for significance values and other statistical data). Avoid vertical rules. The data presented in tables do not duplicate results described elsewhere in the article. All illustrations should be labeled ‘Figure’ and numbered in consecutive Arabic numbers, Figure 1, Figure 2 etc. m the text. If panels of a figure are labeled (a , b, etc.) use the same case when referring to these panels in the text. Drawings reproduced with a high quality laser printer are preferred. Photographs, 1f used, should be of good contrast and printed on glossy paper. Figures, which are recommended for electronic formats such as PNG, JPEG. TIFF (min. 300 dpi) should be also arranged m available dimensions. All figures or tables should be presented in the body of the text. Use the Times New Roman font for all figures and tables. Font sizes size should be from 9 to 11 points.